1. You got stoked every time you were off campus and you could get a "real" coke- you know, one with caffeine. 2. Your significant other stopped kissing you at midnight because they had to go home. If they didn't, your roommates would surely rat you out. 3. You often waited in line for over an hour... to take a test. 4. If you are a boy, you weren't allowed to take said test because you forgot to shave your face that morning. 5. If you are a girl, you weren't allowed to take a test because you were wearing leggings. 6. You had a crush on your EQP or RSP. 7. You know what EQP and RSP mean. 8. Your Book of Mormon class was one of the hardest classes you ever took. 9. On Friday night you camped out in line three or four hours to see a Divine Comedy show. And loved every minute of it. 10. Your favorite sport was ultimate frisbee. A close second was crab soccer. 11. The biggest scandals reported in the "Campus Beat" crime section of the newspaper involved freshman premies throwing water balloons off of their dorm building. 12. You know what a premie is. 13. You know someone who got engaged and married in four months. 14. You got engaged and married in four months. 15. Every year you had a new set of friends because the old ones got married. 16. All the guys you knew sold security or bug control in the summer and impressed the girls with their tales of making $100k in just four months. 17. You didn't think twice when a kid added a scripture reference to his comment in Chemistry class. 18. Landlords could charge an arm and a leg for the housing you lived in because it was "BYU approved." 19. You were embarrassed to say your age if you were over 22 and single. 20. You took American Heritage twice. Okay fine. Three times. 21. Half of the time you went to the library to study and the other half of the time it was to find a date. 22. You know who B-Money is. 23. You never saw a girl's thighs or shoulders on campus. 24. You know what the term "V.L" means. 25. You hiked "the Y" with a bunch of single and over ambitious people your age and hated every second of it. But you pretended you liked it. 26. When you hear the word marriage, you think of it as an option for a possible major. 27. You pull an all nighter... to study. 28. It wasn't uncommon to have a girl in class with her baby. 29. You bailed on FHE and watched The Bachelor instead, but then got a guilt trip from your roommate about it. 30. You made the mistake of trying to go to a store or restaurant on campus on a Tuesday at 11:00 am and hated yourself for it. 31. You attended more bridal showers than birthday parties. 32. After trying to flirt with them for half an hour, you notice the good looking person sitting next to you in the WILK has a wedding ring on. 33. You spent time kissing your significant other at the bells on campus. Or when it got real hot and steamy, squaw peak. 34. You saw a lot of mom jeans and braided belts. 35. Every morning you cursed the stairs on 800 north that went up to campus. 36. You thought nothing of starting class with a prayer. 37. You followed someone walking to their car so that you could get their parking spot. Or better yet, you gave them a ride. Good Samaritan! 38. You know and understand the term "NCMO." Maybe a little too well. 39. You were one of the brightest students in your high school and now you can't score above a 70% on anything. 40. You love all your fellow men. Unless they go to the U. Then they need to stay the hell away from you. 41. You laughed at the above point, but then felt guilty because it has the word "hell" in it. 42. You occasionally saw members of the Renaissance club wearing robes and wielding swords on the lawn and thought nothing of it. 43. You often saw boys trying to seduce girls by playing their guitar and singing for them. 44. You believed (and still believe) that Jimmer is a verb. 45. You went to a "creamery" to do your grocery shopping. 46. You called you professor "Brother Davis" instead of "Mr. Davis." 47. You tried not to stare when you saw a black person on campus. 48. Nearby apartment complexes offered a "marriage guarantee." 49. Every spring you got ready for your interview to see if you were following all the rules and could still go to BYU for the next year. 50. You had your car towed on numerous occasions. Once it was towed when you only ran in somewhere for 15 minutes. 51. The only people who lived in the same building as you were your same gender. 52. You went to a lot of parties on weekends, but there wasn't ever any alcohol there. 53. People napping in the hallways was common. Couples napping and cuddling in the hallways was also common. 54. Your roommate told you they scored an 85% on the test that you scored an 83% on, and you suddenly felt insanely jealous and competitive. 55. You attended the festival of colors and then immediately changed your facebook profile picture to a shot with you covered in chalk. 56. You didn't consider yourself in a legit relationship until you had properly DTRed it. I'm pretty sure in college, almost everyone plays ultimate frisbee. I think that's the only one of those I could relate too. I'm guessing BYU doesn't have coffee bars on campus like University Of Wyoming did. Ultimate frisbee was a Big Deal at my college and at every college I visited. Yes to so many of these. Especially the one about trying to go places at 11 am on a Tuesday. How do I forget about devotional almost every single week? I would also add something like, "You know exactly where the WILK, the MARB, the JSB, the JFSB, and the JKB are." And maybe "You've heard someone make a joke about the Indian outside the library not following the Honor Code. Or you've made the joke yourself." Or even, "You've said no to a weekend invitation by saying you were 'hanging out with Harold' and the person didn't need any further explanation to know you were studying in the library." Oh, BYU. What a lovely, strange place. I'm betting this goes viral. I'm most definitely NOT a BYU grad but so much of this list applies so much to single life in general. Hilarious and brilliant. i'm dying right now. so much truth. remember our whole convo about pinterest??? pin this thing. I agree with Aubrey! This is great and hilarious! Thankfully, due to my history teaching major, I never had to take American Heritage, although all my roommates begged me to help tutor them and edit their papers for it! 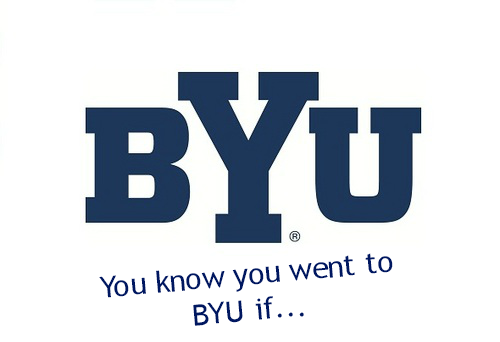 OR you went to BYU so long ago that about half of these you don't get at all... but the others are unforgettable! B Money!!! But that's more my brother's era than mine. I only know him through my bro. Please define all the acronyms...What in the heck do they mean...It's like me putting up PCS and TDY or POV and such. Mindy would get that lingo but you probably don't. Do share what they mean. I love it. And now I have an urge to hike the Y? Yes!!! This was accurate to a T! As a music major, I might also say something along the lines of "You got lost in the HFAC aka Hogwarts Castle more times than you'd like to admit." This list is so true! well I dont get many of the references but I can say napping in hallways was common in my college too but probably because of hangovers!